Genoa soccer fans remained silent on Sunday for an entire 43 minutes of their club's Serie A opener — one minute for each of the 43 victims of the Morandi Bridge collapse earlier this month. In the 43rd minute, spectators began applauding respectfully as the names of those who died in the tragedy 12 days earlier were listed on a giant screen inside the Stadio Luigi Ferraris. Then the fans started chanting "Genova, Genova" — the Italian name of the city. "The first thought always goes to the tragedy," Genoa coach Davide Ballardini said. "You train but every day you take a road or something else that reminds you of it. Our legs and heads were heavy." 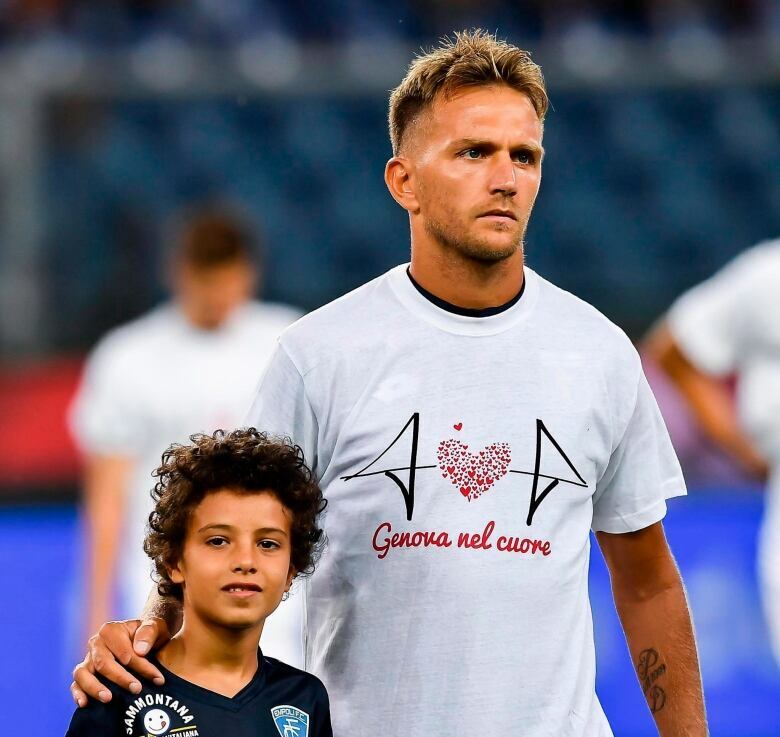 Criscito and the other Genoa players wore T-shirts that read "Genoa nel cuore" — meaning "Genoa in our heart" — with a design featuring a heart in the middle of the bridge span. Players wore black ribbons on their jerseys and the space on their shirts usually reserved for sponsors was left blank. Genoa's opening match against AC Milan scheduled for last weekend was postponed as the city was still in mourning. Sampdoria, Genoa's other club, also had its opening match postponed. It was beaten 1-0 at Udinese when it eventually played its season opener. Udinese fans held aloft a banner that read "Beyond the colours, united in pain." A huge section of the Morandi Bridge collapsed Aug. 14 during a fierce storm, killing 43 people and forcing the evacuation of nearby residents in the densely built-up area.